Raster Calculator is designed to execute a single-line algebraic expression using multiple tools and operators. When multiple tools or operators are used in one expression, the performance of this equation will generally be faster than executing each of the operators or tools individually. 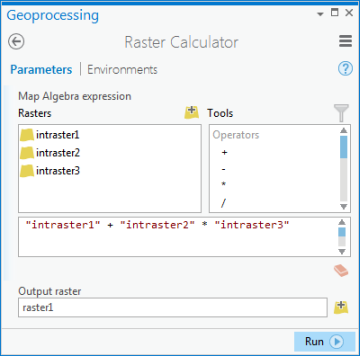 The input Rasters list identifies the input that can be used in the Map Algebra expression. The raster list will contain the layers in the Contents and datasets added with the Add raster button. When the tool is used in ModelBuilder the raster list will also contain Raster model variables. The Tools list is a convenient selection of tools that can be used in the Map Algebra expression. By clicking a tool in the list, the tool name and open and close parentheses [()] will be placed in the expression where the pointer is currently positioned. The remaining input required by the tool must then be entered. A tool can be placed anywhere in the expression, but it should be placed in a position that produces valid Map Algebra syntax. The operators in the list allow you to enter mathematical (addition, division, and so on) and logical (greater than, equal to, and so forth) operators into the expression. By selecting these symbols, that operator will be entered into the expression where the pointer is currently positioned.